Not all programs that support new teachers are created equal. The training and experiences teachers receive greatly influence their ability to work well with students and effectively teach in the early years of their careers. 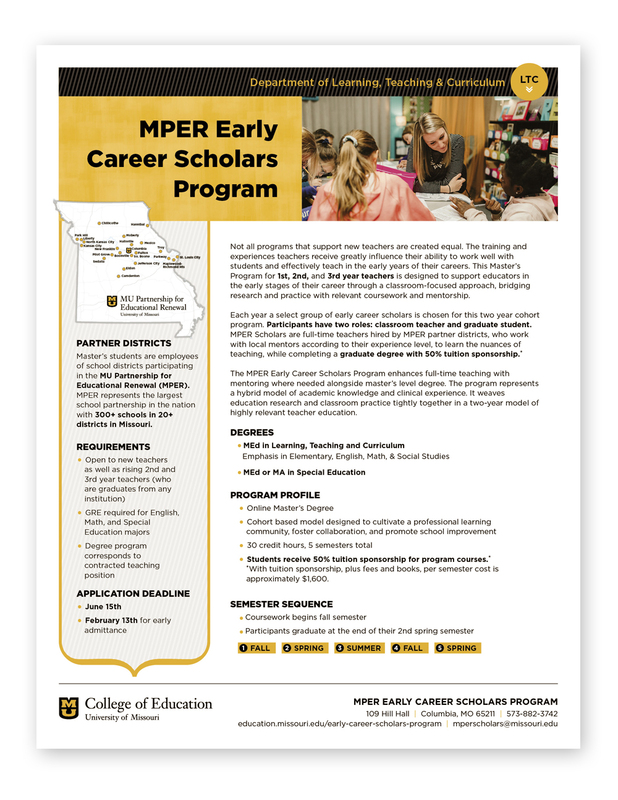 The MPER Early Career Scholars Program is a revised version of the MU Teaching Fellowship Program, and is designed to support educators in the early stages of their career through a classroom-focused approach bridging research and practice with relevant coursework and mentorship. Each year a select group of early career educators is chosen to become MPER Scholars. MPER Scholars have two roles: classroom teacher and graduate student. MPER Scholars are full-time teachers hired by partner districts who work with local mentors learning the nuances of teaching while completing graduate courses. The MPER Early Career Scholars Program enhances full-time teaching with mentoring and a master’s level degree program. The program represents a hybrid model of academic knowledge and clinical experience. It weaves education research and classroom practice tightly together in a two-year model of highly relevant teacher education. Online courses with a cohort-based model designed to cultivate a professional learning community, foster collaboration, and promote school change. Open to new teachers as well as rising 2nd and 3rd year teachers. Open to graduates from any institution. MPER Scholars receive coaching and support from a district assigned mentor who has multiple years of experience, has demonstrated effectiveness in teaching, and is able to provide feedback and lead professional conversations.